Each piece of equipment used in the business should be added to the system. The purchase/replacement cost, useful life and annual capacity must be added. 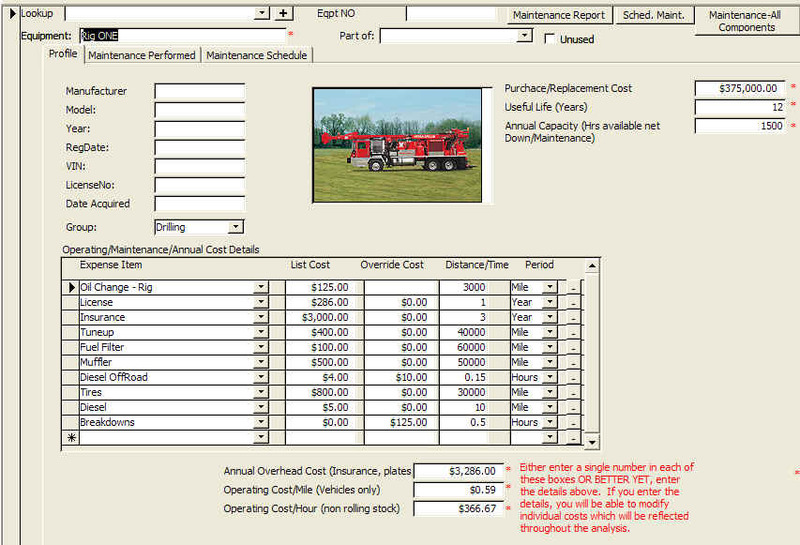 Estimating the cost of operating equipment is very simple and can be as detailed or general as desired. Minimally, a single number for Annual Overhead (insurance, license plates, etc), Operating Costs/Mile (Fuel, Tires, etc.) and Operating Costs/Hour (Fuel, etc) must be entered. A better alternative, however, is to enter detailed requirements and as they are added, the cost per hour or mile is automatically calculated and added to the appropriate cost type. All these costs are then folded into the analysis through each job type in the amounts specified either as miles or hours.